The LG V30. Those are some slim bezels. The corners of the display are curved, and unlike the G6, these are smooth and pleasing to look at. The bottom bezel is super slim, clean, and logoless. Two cameras, one normal, one with a wide angle lens. LG is making a big deal about the f1.6 aperture. The bottom of the back just has an LG logo. The bottom has the usual mic, USB port, and speaker. Another six months, another LG flagship phone. Typically the V series has been LG’s wacky, experimental line with an extra “ticker” screen on the front. This year, though, the V30 is all business. The ticker is gone in exchange for a slim-bezel device and a clean look. With the V30, LG is still basically following the same path that Samsung travels by shipping a heavily skinned phone with a glass back and slow updates. When you do all the same things as Samsung without the marketing budget, it’s hard to stand out. LG did a lot right with the V30 hardware. It has the best front design we’ve seen this year with super-slim bezels that rival the Galaxy S8 and a simple, no-nonsense symmetrical design. There are no logos to distract from the screen, and the only blemishes are an earpiece and a front-facing camera. So far, the V30 is the ultimate expression of the slim-bezel, symmetrical smartphone design. The front of the V30 is beautiful in person, and everyone who sees it usually lets out a “nice” or some other comment when the screen turns on. LG hit most of the items you’d want on the “hardware checklist,” too. You get a headphone jack, a MicroSD card, and IP68 dust and water ingress protection. That headphone jack also sounds pretty good, since it’s powered by a higher-quality DAC than normal (which LG brands with the complete nonsense phrase “Quad DAC”). You even get a few equalizer presets. The back is glass, which is a disappointment. It makes the phone more fragile than it needs to be—plus, it makes for a smudgy fingerprint magnet—just so LG can have an easier time routing the signals in and out of the device. With the entire front and back being glass, I’d imagine the V30 would not survive a drop very well. A tiny cross-hatch pattern is carved into the colored panel under the glass, making the back look a bit like a lenticular hologram. The glass back at least enables wireless charging, which is built into the device. The V30 supports “fast” wireless charging through the Qi and PMA wireless standards. Here, “fast” is described as going from 0- to 50-percent battery in 55 minutes. The phone also supports Qualcomm Quick Charge 3.0 and USB-PD, which are both much faster—you’ll go from 0 to 50 in 35 minutes. On the back, you get LG’s typical setup—a combination clicky power button and fingerprint reader, along with a dual-lens camera system. The fingerprint reader feels a bit small, but it works great and lives in an easy-to-reach location. For the camera you have two 16MP sensors, and the extra one has a wide-angle lens. The cameras are almost flush with the body, but, uh, they’re not quite flush with the body. They stick out just a bit. Enlarge / That’s the LCD equipped LG G6 on the left, and the V30 on the right, both showing a solid grey image. The photo processing here aims to exaggerate the clarity difference for the camera—in reality, the effect is more subtle. Like the Pixel 2 XL, the V30 uses an LG OLED display panel. Also like the Pixel 2 XL, this is a sub-par panel that won’t compare to the Samsung OLEDs smartphones are often equipped with. 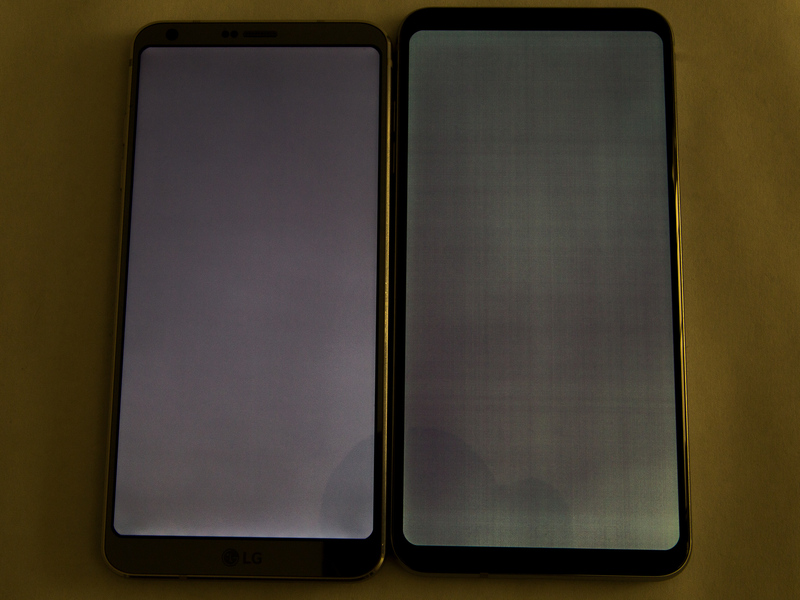 Between the pre-release V30, Pixel 2 XL, and this final V30, I’ve seen three of these LG panels so far, and they all have the same issues. My biggest issue with the Pixel 2 XL display is still here: at low brightness, the display is grainy and dirty looking. The screen is constantly cluttered with lines and artifacts, but this happens most noticeably on low brightness. Both V30s I’ve tried have had a second issue, though: uneven lighting. A solid color on the V30 ends up looking like a gradient because the bottom of the display is just brighter than the top. LG’s OLED panels aren’t a deal breaker—it’s something you can learn to live with and ignore—but they’re disappointing given that most other flagship phones have beautiful, mostly flawless screens. Like with most other slim-bezel phones released this year, you get a super-tall 18:9 screen, inflating the diagonal screen measurement to 6.0 inches. In reality, the phone is only as wide as a 5.5-inch phone from last year, but that is a great size. The glass on the front and back of the V30 is rounded slightly on the edges, which blends well into the rounded metal sides. If you must have a glass-backed phone, the LG’s hardware is solid. It’s disappointing that the display is subpar, but you can learn to live with it. In exchange you get a super slim bezel design, an SD card, and a headphone jack. The closest competing hardware to this is, of course, the Galaxy S8, and I’d gladly take the V30’s display over the S8’s impossible-to-use fingerprint scanner any day. Let’s play a game. Does LG’s software look more like Android, or iOS? Here’s the home screen. The software is the biggest downside to the V30. First, it ships with an old version of Android—7.1 Nougat—and second, it’s skinned to look like a counterfeit iOS device. Android’s standard app drawer is gone. Instead, just as in iOS, every app icon gets dumped onto the home screen. The default layout of my AT&T LG V30 spreads 50 app icons across two screens and four folders (and some of the folders have pages). Finding anything is a challenge. The whole home screen is a mess, but this is easily fixed by installing a third-party launcher, which can restore the normal app drawer and app search. Such a strategy will allow you to treat the desktop like a “favorite apps” list and not a dumping ground for everything. In addition to the iOS-style home screen layout, the icons all look like iOS, too, with rounded square backgrounds applied to every app. The folders use an iOS-style full-screen display rather than Android’s in-place folder popup, and the settings are reskinned to look as much like iOS as possible. Why would you ever want your Android phone software to look like a knockoff of iOS? It’s totally fine if an OEM doesn’t have a visionary software design direction, but in that case, just leave everything alone so it looks like a normal Android phone. “Copy iOS” is not a design direction: this is an $800 device, and the copycat software design cheapens the entire feel of the phone. LG’s skinned design also clashes with the rest of the Android ecosystem. LG can only skin the OS and the included LG app, so these all follow LG’s design style. LG can’t skin the Google apps, though, and those all follow Google’s design philosophy, called “Material Design.” Google has made Material Design easy for third-party developers to implement with comprehensive design guidelines and code samples, so most of the third-party ecosystem follows Material Design, too. This leads to an aesthetic rift when you used a skinned Android phone. The OS and packed-in OEM apps follow one design style, while Google’s apps and all other apps follow a different design style. The result is a messy, sometimes confusing mix of competing design philosophies. LG’s user experience would be much better if it follow Material Design, just like most others on Android. The lock screen, home screen, and folder interfaces. Recent apps, the notification panel, and quick settings are all here. There’s a few extra buttons and a new coat of paint, but the functionality is all here. Here’s the settings and the home screen again, but this time I dug into the settings and turned on the app drawer. It’s a bit more normal now. The good news is that LG didn’t break anything. Android’s important, irreplaceable interfaces—the lockscreen, notification panel, recent apps, and settings—are still usable, albeit a bit uglier than usual. Like with most skinned phones, I’d advise you to replace as much as you can through the Play Store (most importantly the home screen and keyboard). One interesting oddity is that (on my AT&T version, at least) Firefox is the default browser. Chrome comes pre-installed, but unless you dig through the settings, Firefox will be the default browser for links opened from apps. On a desktop OS, default browser shenanigans are a normal thing, and every browser will detect if it is the default on startup and offer to change the setting for you. There is no default browser detection on Android, though, and if you open Chrome, it won’t offer to make itself the default. This makes changing the default browser difficult, since you have to find it in the settings. Searching for “default” or “browser” in the settings won’t bring you to the right screen. You need to know it’s in Settings -> Apps -> Menu -> Configure Apps -> Browser app. Whew. Why does LG even bother with this software package? There isn’t a single thing here that is an improvement over the stock Android that LG started with. It’s a wonder that companies burn through resources to create something like this. LG’s skin offers no value to the end user, it fragments the user interface, it creates more work for LG, and it makes updates harder. Maybe the whole project makes some LG executive feel better because now LG’s software doesn’t look like everyone else’s software. The problem is, it looks worse.